Veteran clothing retailer Mill Crest Vintage, of Lambertville, NJ has sold its 4,000+ piece collection to fellow retailer, Malena’s Boutique of West Chester, PA, in order to make room for over 1,000 vintage wedding dresses. Mill Crest Vintage formally announced today the sale of one of the largest known vintage fashion collections in North America to Malena’s Vintage Boutique, in order to now concentrate solely on its collection of unique vintage wedding dresses. As a four-time Brides Choice Award winner and two-time recipient of The People’s Choice Award for Vintage Clothing, Mill Crest Vintage has a reputation for discovering only the finest authentic, one-of-a-kind vintage fashions from around the globe. The veteran vintage retailer has completely renovated its Lambertville, NJ boutique to make room for its vintage bridal collection, which includes more than 1,000 authentic vintage dresses and an array of coordinating accessories. With a newly designed bridal boutique that is open by appointment only, brides will enjoy the high quality of service and personalized bridal consultations that only a small boutique can offer. The vintage bridal boutique will also offer a wide selection of its bridal collection through its website millcrestvintage.com. “Sharing a true passion for vintage fashion over the past 30 years, has been wonderful. Now the dream is to share this same passion exclusively with brides-to-be,” Stated Mill Crest Vintage owners, Paula Cooperman and Erica Sullivan. 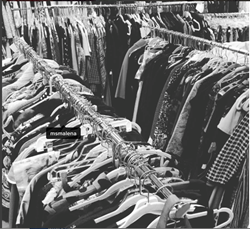 The well edited collection of ladies vintage fashions and accessories has been bought by three-time Best in Philly award winner, Malena’s Vintage Boutique. Open since 2003, Malena’s Vintage Boutique specializes in wearable ladies vintage clothing and jewelry. With a fashion design degree from Pratt Institute, owner Malena Martinez’s education, along with a passion for vintage fashions, have given the retailer an edge in the industry and a keen eye for finding what the customer wants. “It takes decades to create such a carefully edited collection,” says Martinez “Taking over a hand selected vintage collection such as this one is a once in a lifetime opportunity. It is truly exciting to incorporate this collection into current inventory and share it with customers”. Over the course of the next few months, the newly acquired collection will be made available in the West Chester, PA brick and mortar boutique, online at malenasboutique.com, and by private appointments to the trade.